Jianbing: a Chinese breakfast crepe. When she was returning to Portland from vacation in Thailand in 2014, Alisa Grandy had an eight-hour layover in the Beijing airport. Instead of taking a long nap (which is what I would have done), she decided to hop on a train and get a peek at the city. She didn’t speak any Chinese, and wasn’t sure of her way around. She decided if she kept track of her train, took it for just a few stops, and got straight back on the train to the airport after her little walkabout, she wouldn’t get lost (spoiler alert: she made it!). It was morning, and when she got off the train, Alisa saw that on many of the street corners, vendors were whipping up what looked like a tasty snack. She decided to get in line and give it a try. When she got to the head of the queue, she smiled, held up her finger for “one, please,” and hoped for the best. What she got was the exquisite flavor and texture. She got her first sensation of a jianbing: a Chinese breakfast crepe. Back in Portland, Alisa decided she wanted to re-create her experience. There wasn’t much information online at the time, and she was able to get close, but there was something missing. She says she finally went to Uwajimaya, Beaverton’s large asian market, looked around and picked one of everything off the shelves that looked like it might have contributed to what she had found in Beijing, and basically reverse-engineered the thing. The result? One of Portland’s most popular and unique food carts, Bing Mi. Alisa opened her first cart at SW 3rd and Ash in 2014, and moved to SW 9th & Alder in January of 2015. Bing Mi was getting popular and media accolades, with accompanying lines around the block. She and her husband, Neal, opened a second Bing Mi location in partnership with Baerlic Brewing at the Barley pod (NE 61st & Halsey) this past spring. Making her own regional recipe. Jianbing is very popular as breakfast street food in China, and there are many regional variations. Alisa’s start with a wheat-based crepe with an egg scrambled on top. They are filled with black bean paste, pickled vegetables, cilantro, and a wonton cracker for a delicious, savory crunch. Customers can order custom-blended chili paste and/or plum sauce to taste. You also have the option of adding sausage as well. But a jianbing is more than the sum of its parts—it really must be tasted to be experienced. Luckily, with the low price tag (Bing Mi seems to crop up on everyone’s best Cheap Eats list), that’s not hard to do! 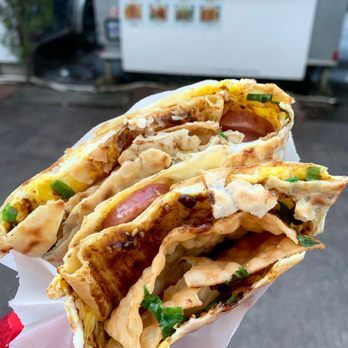 If you’re hungry and have been working your way down the list of Portland to-do’s, make sure to stop to Bing Mi and grab a tasty jianbing! Subscribe to our e-mail list for future savings!